Happy Tuesday everyone! Today’s Tuesday Ten is pretty straightforward. If you’re looking to get in the fall spirit but don’t want to hit up a crowded apple orchard (I don’t blame you – Sunday was insane), then look no further. 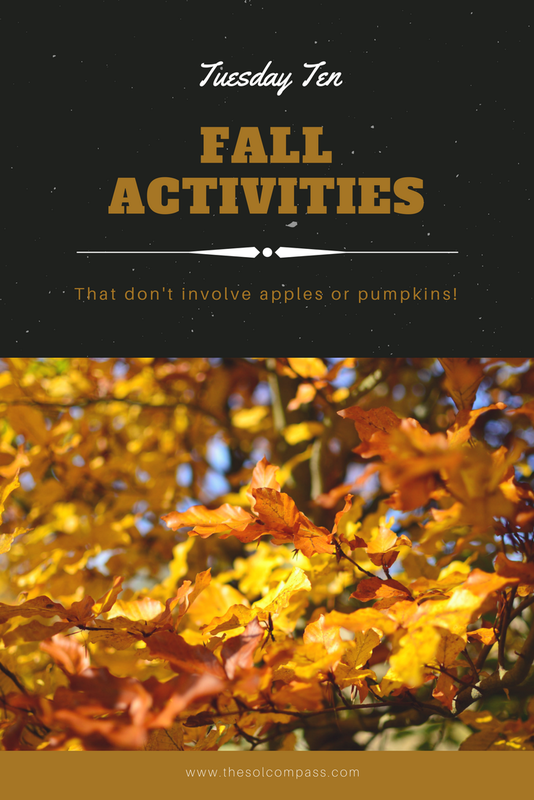 I have ten fantastic ideas for you to embrace and celebrate autumn’s arrival! Bake. Whether your baking involves apples or not, fall is the perfect time to fire up the oven again (does anyone else hate how hot the kitchen gets when you use the oven in the summer?!) Personally I’m a fan of some warm cookies outside in the cool fall air, but whatever floats your boat. Rocky Horror Picture Show. Rocky Horror is the only cult film I really follow along with, and I was absolutely devastated when Midnight Madness in Harvard Square came to an end (it’s just not the same Downtown!) Last year Jenn and I saw it in Austin at the Alamo Drafthouse (100% recommend checking this theatre out, read my post here for more info!) and the year before it we went to The Strand, a historic theatre out in Clinton, MA. Short story long, I definitely recommend trying to find a theatre with a shadow cast near you! Go antiquing. Last weekend was the first weekend in a while that B and I didn’t have a single plan. We took this opportunity to drive with the windows down and stop at each antique store along the way. We met so many kind people and found items with incredible history and character. You really just never know what you might find at an antique shop! Light a candle and read a book. After an active and busy summer, some down time is exactly what I need during September and October. My reading list has gotten out of hand, so I’m looking to put a dent in it finally. Whether your candle is fall scented or otherwise, it really puts me in the right mood to immerse myself in my book. Have a bonfire and outdoor movie night. Bonfires are one of my favorite things, and I don’t have them nearly as much as I wish I did. I want to get some friends together for one last round of s’mores and fire up the projector with a classic film! Food Festivals. There are so many awesome food festivals this fall that don’t even involve apples or pumpkins! This weekend there’s Fluff Fest in Somerville and Dumpling Fest in Cambridge! A quick Google search will give you a better idea of what’s going on in your area, but fall seems to always have a good number of food truck festivals at the very least! Get Lost In A Corn Maze. Something about corn mazes has always excited me. Maybe it’s because I love puzzles, but if you can find a corn maze near you I promise they aren’t just for kids! Make chili. While the days are still warm and sunny, New England nights have slowly but surely started to embrace sweater weather. I’ve been craving some homemade chili for most of September, and can’t wait to enjoy some curled up under a blanket! Stargaze. Whether you go to an observatory or your backyard, the fall sky is absolutely breathtaking. What’s on your bucket list for fall? Let me know in the comments! Have a great day! Baking has been my new found hobby lately. With all the fall flavors (cinnamon, honey, pumpkin spice, apple) I’ve been trying to dabble in the baking world! Thanks for the other tips! I’ll definitely be doing a lot of those!